The legendary French striker is part of Roberto Martinez’s coaching staff. Henry and Belgium will face France in the semi-final on Tuesday. FRANCE STRIKER OLIVIER Giroud has admitted that he would have preferred legendary striker Thierry Henry to be in Les Bleus’ dugout as opposed to the Belgium one for Tuesday’s World Cup semi-final. 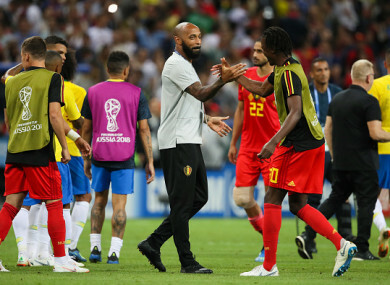 Henry is an assistant coach to Roberto Martinez in the Belgium set up and has worked closely with the forwards, who have played their part in helping the team reach the final four of the competition. The ex-Arsenal attacker’s loyalties will be stretched in the St Petersburg clash, though, as he is France’s all-time leading scorer with 51 career goals in 123 matches. Giroud, who ranks joint fourth on the list of marksman for the country alongside Zinedine Zidane on 31 goals, admits that he would rather Henry was giving him advice than Romelu Lukaku, who will likely lead the line for France’s opponents. “I’d had preferred him to be with us and to be giving his advice to me,” the Chelsea forward confessed. “He’s a living legend of French football and we have a lot of respect for him. We have a lot of respect for what he’s done, but we’re not going to think about it very much. Meanwhile, Giroud thinks that going to Belgium was a natural step for the ex-Monaco, Juventus and NY Red Bulls hitman. “He’s there to learn and to develop as a coach,” he continued. Giroud has yet to find the net at Russia 2018 but has established himself at the head of a 4-2-3-1 formation, in which Kylian Mbappe and Antoine Griezmann have particularly caught the eye offensively. France are aiming to win the World Cup for a second time, 20 years after they lifted the trophy on home soil thanks to a 3-0 win over Brazil in Saint-Denis. Email “Giroud on Henry's Belgium-France dilemma: 'I’d have preferred him with us!'”. Feedback on “Giroud on Henry's Belgium-France dilemma: 'I’d have preferred him with us! '”.